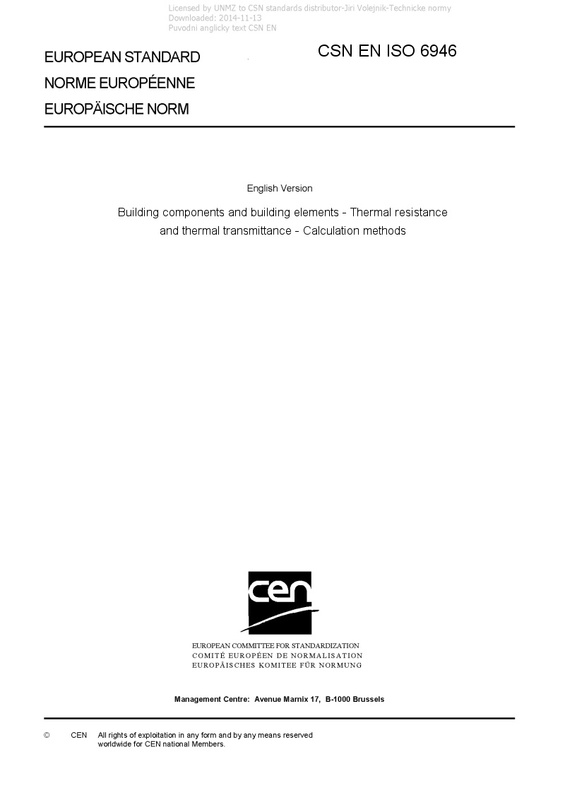 EN ISO 6946 Building components and building elements - Thermal resistance and thermal transmittance - Calculation methods - ISO 6946:2017 provides the method of calculation of the thermal resistance and thermal transmittance of building components and building elements, excluding doors, windows and other glazed units, curtain walling, components which involve heat transfer to the ground, and components through which air is designed to permeate. The calculation method is based on the appropriate design thermal conductivities or design thermal resistances of the materials and products for the application concerned. The method applies to components and elements consisting of thermally homogeneous layers (which can include air layers). ISO 6946:2017 also provides an approximate method that can be used for elements containing inhomogeneous layers, including the effect of metal fasteners, by means of a correction term given in Annex F. Other cases where insulation is bridged by metal are outside the scope of ISO 6946:2017. NOTE Table 1 in the Introduction shows the relative position of ISO 6946:2017 within the set of EPB standards in the context of the modular structure as set out in ISO 52000-1.